Past month or so got you down? Want to escape from it all? Feel like getting lost in someone else’s problems bigger than your own? William Landay’s powerful courtroom page-turner Defending Jacob might just be the cure for you. The Case: Assistant district attorney Andy Barber heads a high-profile murder trial of a brutally slain teen-aged bully until his own 14-year-old son becomes the prime suspect for the crime. The Verdict: I was in need of distraction from the daily news, looking for one of those nerve-plucking, gavel-pounding legal thrillers that flung John Grisham and Scott Turow to fame. While Landay’s bestseller doesn’t quite measure up to Grisham’s A Time to Kill or Turow’s Presumed Innocent – in fairness, beyond To Kill a Mockingbird, what does? – Defending Jacob comes damn close. Landay, a former district attorney and father himself, keeps the action buzzing and suspense building by delving into both the legal machinations of a media-frenzied trial and the personal trauma of a family unraveling under the strain of such a horrible ordeal. He also provides colorful details and useful insights that could only be gleaned from someone grinding out years in court. I came away from this, Landay’s third novel, with a better comprehension for what a grand jury does, a strong fascination with the so-called “murder gene,” and a full appreciation for the best legal advice I ever received from my own lawyer wife: keep your mouth shut. Innocent, guilty, or uncertain, when facing a badge asking you questions, demand to see your attorney and then clamp your lips. So, my advice to you: shut off the news (alternative, fake, or otherwise), pour yourself a well-aged single malt, fire up a fine cigar, and settle in with a good book. 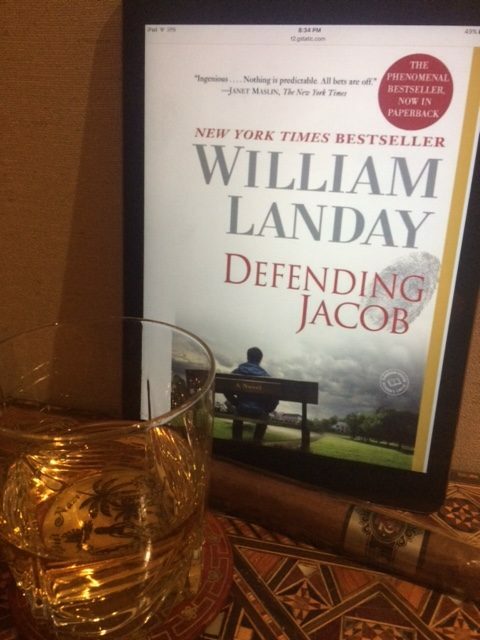 Whisky and stogie optional; Defending Jacob highly recommended! Seeing Red! My Maserati does 185!